Hope strives to be a safe haven for God's unconditional love. Every person is invited and encouraged to participate in all Hope activities and roles, including membership and leadership. In this world, most human conflict and separation are caused by our differences, like race, ethnicity, gender, sexual orientation, economic status, political positions, and more. Hope embraces diversity and welcomes all who come through our doors, without exception. in order that they may share God's love with others. When is the church's service? Hope gathers for a relaxed, traditional worship every Sunday morning at 10:00 A.M. Services are informal and casual, with some people in their Sunday best and others in jeans. What happens during church at Hope? Adults and children gather together to start our service with a few opening announcements, songs and prayers. About 15 minutes into the service children, preschool through fifth grade, come forward for a blessing and are then accompanied by their teachers to the Sunday School room during the Sermon. I just want to blend in--will I have to stand up and introduce myself? Hope is a welcoming congregation, but we won’t ask you to stand up and introduce yourself. A Friendship Pad will be passed down your row. Everyone is encouraged to sign, so the people in the row get to know their neighbors, and, if you wish, provide contact information for follow-up. Childcare is available in the nursery for infants up to 3-year-olds. A member of the greeting team will be happy to show you where the nursery and Sunday School classrooms are located. All adults who work with children at Hope are screened and have passed a background check. Sunday School classes are offered for preschool through high school. Children of preschool age through 5th grade come forward for a blessing about 15 minutes into the service and then are accompanied by their teachers to Sunday School. Middle and high school youth as well as adults meet after the service. Hope offers a Youth Group for middle and high school students called Lighthouse This group meets weekly, usually on a Sunday evening, and offers a chance for Hope’s teens to meet in a social setting for activities such as service projects, gym nights, movie nights, scavenger hunts, and lock ins usually at the church. A younger group, called FROG (Forever Relying On God) meets on Thursday evenings for fun and fellowship. All are welcome. What does Hope do beyond Worship and Teaching? 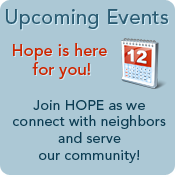 Hope is committed to serving our community and to promoting interfaith cooperation. For example, every Wednesday night you’ll find members of Hope volunteering at the People’s Resource Center providing food for needy residents in DuPage county. We share our church building and frequently have joint activities with Bethel New Life Church, which has a primarily African-American congregation. We support sister churches in Chicago’s Englewood neighborhood (Hope Presbyterian - Chicago) and in Havana, Cuba (La Fernanda Presbyterian Church). Our interfaith partners from the Islamic, Jewish, Native American, and Sikh communities join in diversity discussions with us to seek understanding and form relationships across Wheaton and our larger community. To learn more, use the “Outreach” or the “Ministry/Partners” tabs at the top of this and the home page. How do I find out about joining Hope?